> BigCommerce > Is SaaS ecommerce a better fit for your business? When was the last time you evaluated SaaS? 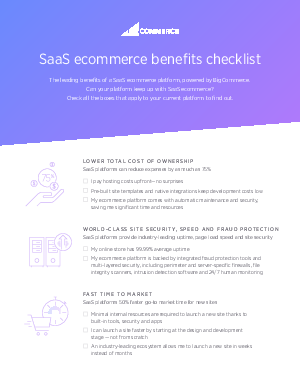 With some big decisions ahead for your online store as the ecommerce landscape is changing, we designed a SaaS Ecommerce Benefits Checklist to easily evaluate the latest features powering SaaS ecommerce platforms. You’re no longer limited to the complexities of an on-premise solution. Find out how you can save your business from complexity without sacrificing performance in this checklist.